Power Rangers in Space: The Bad Character Complex | personal.amy-wong.com - A Blog by Amy Wong. Power Rangers in Space had a few things it had to overcome. First, it was the prior season- Turbo wasn’t popular. It switched the old Rangers in a full rotation because, well, they were really old by then. It was impossible to keep them in school any longer LOL Plus, as hilarious as Divatox was as a baddie, the storylines dealt in the show weren’t really all that complicated. The other obstacle in PRiS was that it wasn’t supposed to be in space at all! 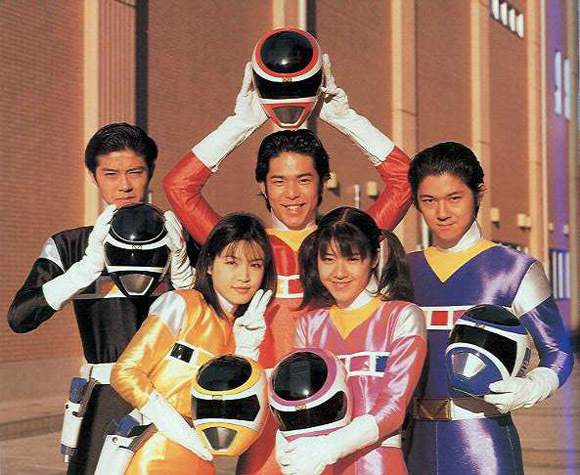 But due to miscommunication and misconceptions, the American production thought the virtual world in the original Denji Sentai Megaranger series (電磁戦隊メガレンジャー) was outter space. The good thing? It let the whole production of PRiS run free, creating one of the most complex relationships towards a baddie of the Zordon era. Sure we have explored character arcs where essentially good characters have been playing for the dark side, but it had always been due to enchantments, or some weird supernatural modification. It was a plot point when Tommy became the Green Ranger and worked for Rita Repulsa — I even think Kat and Kimberly were turned for a bit during their times. In Power Rangers in Space, however, Karone — Andros kidnapped sister — as Astronema is a baddie because that’s everything she’s known. Her memories of her brother are faded, only as a photo she kept on that necklace, as she’s been manipulated psychologically to be Astronema by her “foster parent” or her “captor” Ecliptor, who at times shows a certain parental interest… but just slightly. Unlike Rita Repulsa, Lord Zedd, King Mondo, or (the hilarious) Divatox, Astronema is “daddy’s” (Dark Specter) girl. Everyone else had failed to destroy the Rangers, so Astronema — all pop punk power rock wig and all — says she can do it. Maybe it is to prove herself to Dark Specter, maybe it’s an inferiority complex since she’s the most “human-like” of the baddies. But in the course of one season — okay, that’s a bit unbelievable — she gives a pretty complete turnaround and freaking goes on a date with the Silver Ranger! At the opportunity of a “normal” life, Astronema forgets about being Astronema to resemble Karone. Once it’s revealed that Astronema is wavering in evilness, she gets… “modified” in order to keep her in check, leading to a battle (of not so epic proportions) between siblings. Sure Andros had been mopping about his sister 50% of the time instead of getting together with Ashley, but it’s still a bit sad when he carries his sister and destroys Zordon’s capsule. In retrospect, it would have been awesome if Karone had passed away at the hands of her brother due to the evilness of fate, but alas… Power Rangers is for children, and thus Karone is revived and magically transformed to a “good girl” by Andros’ tears (how cheese of their part, LOL). Of course, Karone’s character arc leaks into Power Rangers: Lost Galaxy, in which she completes a full circle becoming an official Pink Ranger. Pretty incredible considering what Power Rangers is known for, non? What do you think of the franchise? Which series is your favorite? TOEI has uploaded a couple of episodes of Megaranger (as well as other rangers, and Masked Rider, and Jiban(!)). Can see why they would think it’s the space, though… in all honesty, if they had seen one full episode they would have known it’s not SPACE. People obviously just saw the intro! Typical! Like students reading the first and last pages of a book to pretend they’ve read it. I thought that the Power Rangers franchise jumped the shark with Turbo – my point to stop caring about the Power Rangers. But I did watch Dino Thunder because of the original Green Ranger being part of the show, lol. I did jump the shark in Turbo, so In Space had to overcome that for the ratings. I did watch Tommy in Dino Thunder haha – wasn’t that the season with all the Red Rangers? I also saw that episode hahahaha. One thing I didn’t know is that Power Rangers is now part of Nickelodeon, which to me is super weird.